German rabbi; born Feb. 6, 1801, at Dotzheim, near Wiesbaden; died Dec. 25, 1884, at Berenberg. At the age of thirteen he began his theological studies at Mayence, in the yeshibah of Rabbi Herz Scheyer, applying himself assiduously at the same time to secular studies under Michael Creizenach. Four years later he left Mayence to accept a position as private tutor at Herborn, Nassau, where he remained until 1824. In that year he entered the University of Marburg, where he studied pedagogy, history, and Oriental languages. While untiring in his efforts for the moral elevation of the young, Herxheimer's chief aim was the development of agricultural pursuits among his coreligionists. He also devoted much time and effort to the amelioration of the condition of Palestinian and Turkish Jews. 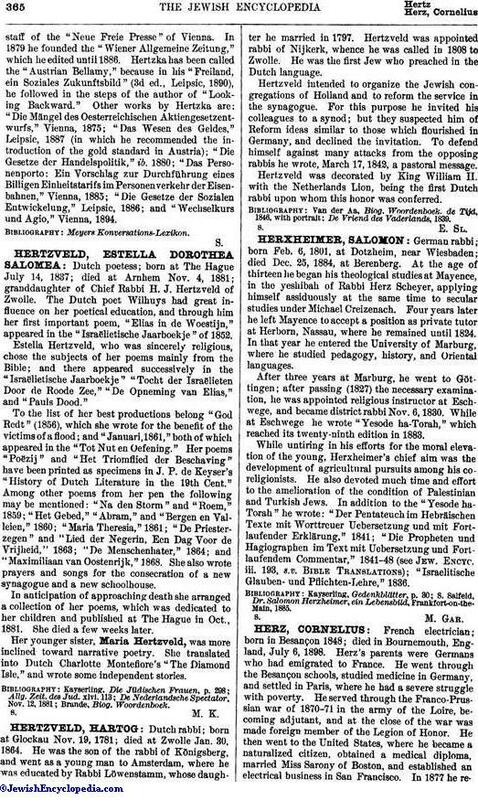 In addition to the "Yesode ha-Torah" he wrote: "Der Pentateuch im Hebräischen Texte mit Worttreuer Uebersetzung und mit Fortlaufender Erklärung," 1841; "Die Propheten und Hagiographen im Text mit Uebersetzung und Fortlaufendem Commentar," 1841-48 (see Jew. Encyc. iii. 193, s.v. Bible Translations); "Israelitische Glauben- und Pflichten-Lehre," 1836. S. Salfeld, Dr. Salomon Herxheimer, ein Lebensbild, Frankfort-on-the-Main, 1885.